While flying to Austin, I had a layover in Chicago. I was flying an airline I normally don't fly and therefore ended up in a part of O'Hare I haven't been in before. Tucked in a corner i found tea's answer to Starbucks, Argo Tea. They had soooo many different offerings! Bubble tea, tea sparklers, sangria tea... I was overwhemed. The packaging and cups were so cute too! I would love one of these in Rochester! 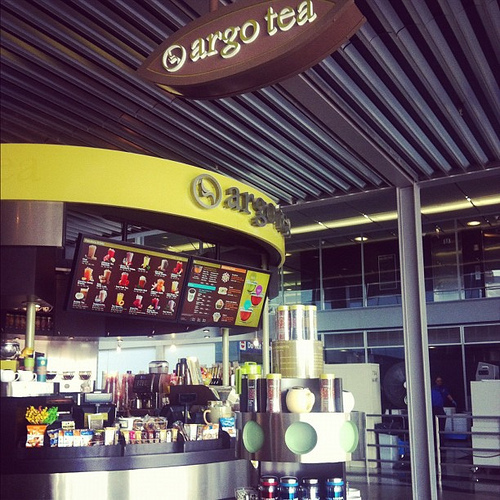 Argo Tea is my FAVORITE thing about flying through Chicago! My personal favorite is the Carolina Honey, but I'm a Southern girl at heart.